Could it be the man standing in the background? Is it the unexplained circle of watersripples? One of the things that popped out at me was that the debris/foliage in the water shows like stars in the sky, or just dust on a scanning platter. Hmmm. Something about the reflection of the swans? 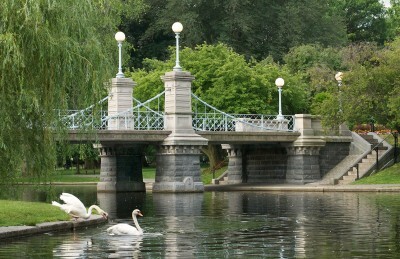 Andy, you should go to Roger Williams Park in Providence, RI. Fewer crowds, and IMHO the landscaping is better. Dunno about lesbian swans, though. Make sure you go to the carousel, make friends with the keeper, he’ll let you in for early morning shots before the kiddies arrive. Finally, print the damn image and hang it on your wall, and let folks tell you how lovely it is. Only you will see the imperfections. Over sharpening on the trees? Andy, I had a similar revelation a couple weeks back. I was becoming paralyzed by the process of organizing and tweaking my pictures and as a result was taking fewer and fewer of them. The solution, for me, was to set the camera to jpg and force myself to really think through a shot before I press the shutter button. Sure, I can tweak the shot a hit later, but doing so isn’t as easy. Also, storing the photos as jpgs allows me and my wife to get at them much easier. Want to send an image to family via email? No more export. Just drag and drop. It’s farmless taxing on our MacBook too. Once I wean myself from my former habits I may switch to raw+jpeg mode and use apertures new import tools to import raw files only when I blew the exposure on a great shot or something. I agree with Ivo. It is the unexplained water ripples. It has to be the light on the left. It looks like it is behind the tree at it’s base, but the post and light are in front of the tree. I keep seeing an Escher drawing. It’s a lovely picture, Andy, but my untrained eye keeps coming back to the lights on the bridge. They appear to be lit, even though daylight has arrived, and are perhaps just bright enough to detract from the overall scene. The lamps are little intrusively white, but for me it is the bit of sky in the top right hand corner. I keep looking over there and there is nothing to see. Those swans aren’t lesbians. They’re just big-boned. I can’t spot the flaw. It’s just a pretty pick-sha to me. But my knowledge of photo processing is very limited. I know how to crop, and uh, I heard once that a little unsharp mask goes a long way. The Public Garden is ACTUALLY IN PHILADELPHIA, PENNSYLVANIA. Busted! No… actually I happened to be at almost this exact spot this afternoon. Andy, if you’d stuck around 8 hours or so I might have recognized you and said hello. Firstly, Andy, this is your moment of personal perception and no-one else’s, so it doesn’t really matter if there is a blemish, go with the flow and live with it! Secondly, the only thing that attracts my attention away from the swans is the amount of light around the steps up the bank. Thirdly, what do I know? – other than it’s a very tranquil picture which should be on your wall already! I saw something wise on a website once: “Better is the enemy of good.” I don’t remember where, but I always thought it was rather apt. Is that tree trunk really that green? I mean, if it is, okay, but … really? Very nice. The only thing I see that hasn’t been mentioned as a possibility is the bright area of grass between the bridge supports. Ok, I’ll go with “Something seems wrong with the water in the extreme lower left corner, just to the left on the standing bird’s reflection.” Hard to tell at iPad screen resolution, but the ripple and reflection patterns look like they’ve been modified. But who knows, if you hadn’t come up with this devious deceive to make us closely examine your work…. Actually this reminds me of the time I painted my vaulted living room ceiling. I ran out of paint in the middle of it and the next batch of paint was ever so slightly a different shade of white. I could see the line where the paint changed every time I leaned back in my recliner, but no one else ever seemed to notice it, especially after I stopped pointing it out to them. Most folks who I showed it to just thought it was a shadow. Now you got us chasing your shadows, driving up your hit count and getting us to study your pictures. Well played Sir, well played. This post is THE example of why you are the best tech journalist in the country. You talk about how we as humans interact with the whatever thing. And this is the true separator. Are willing to be honest about how it effected you personally. The phrnomenon you speak of today is why “addition by subtraction” is such a misunderstood but critically important design component. Come on, Andy, you’re better than this. The hippopotamuses look like swans. Fond memories – I particularly recall spending New Year’s Eve in the Public Garden at the inaugural First Night celebration. Must have been around 1977? Anyway, there was a light coating of snow on the ground that served to reflect the lights of the fireworks being launched from the Common. Quite lovely. As for the photo, I should first note that this is all IMHO and YMMV and other such caveats, but I don’t think there is anything technically wrong with the image. I’d prefer colors that are a bit more saturated and vibrant, but that’s just my taste. I suspect, as others have already noted, that there is some glaring issue you’ve introduced – but that only your eyes really notice. Compositionally, it’s pleasing enough and quite lovely to view. The next time, you might want to try for something a little more unbalanced to add some drama. Perhaps a different, closer, view of the swans would be interesting. Or not. Ultimately, I’d suggest keeping in mind the notion that real photographers ship. Print it, hang it, and enjoy the image. Maybe too much cloned tree by the rightmost lamp. Andy I think you are just describing creativity, or at least the creative process. That Photoshop, buttons, and amateur-ness is involved is incidental. It’s a great photo, I found the same problem with Photoshop. Because you can change something you do….. And that’s not always a good thing! Love your wit and style, Uk reader here saying ‘hi”. This really is a great photo – as well as a great brian tease to your readers. My only quibble with the photo may be the lamps seem a “bit” too bright in comparison with the rest of the photo. But then I am no pro, just a consumer of pretty, visual images ! I would echo the comments of the UK reader – your wit & style brighten my day whenever I read/see your work – Thanks. Previous PostPrevious Apple’s Magic Trackpad – Just the start of the magic trick? Next PostNext Photoshop Disasters: The Home Game ANSWER!